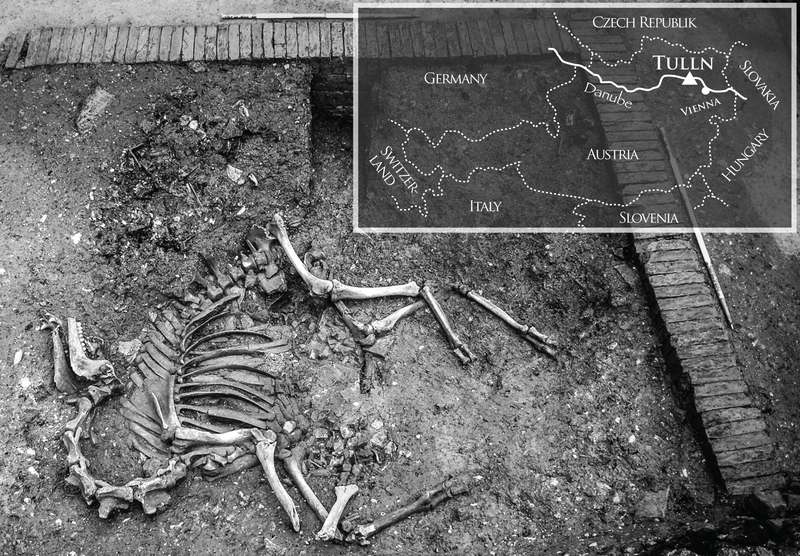 Researchers excavated the first complete skeleton of a camel in central Europe — one that may have started out life in the army and ended it as a curiosity. In a cellar in Tulln, Austria, archeologists excavated the ground before a new shopping center could be built. In a filled-in basement, along with household trash and discarded stove parts, a complete camel skeleton was found. At first, it was assumed that they'd found a weirdly-shaped cow or horse. But eventually, Dr. Alfred Galik told the BBC, "First I saw the mandible, which looked a bit like a strange-shaped cattle; then I saw the cervical vertebrae, which looked like horse. Finally, the long bones and metapodials [foot bones] identified the skeleton as a camel." But what kind of camel? And how did it end up in this basement? In a study published in PLOS One, the researchers come up plausible answers to that question. Through genetic analysis and looking at the shapes of the camel's bones, researchers determined that the camel was a hybrid, as it had features of both a Bactrian camel and a dromedary. For the Ottomans, hybrids were perfect for transportation and for the occasional ride. This particular camel skeleton had no marks of being butchered or gnawed on by rodents. It also didn't have the wear and tear that would identify it as a beast of burden, so it was probably a riding camel. Metal finds allowed a narrow and high resolution dating of the context. A coin—a so called "Rechenpfenning" depicts the countenance of King Louis XIV of France was dated from 1643 to 1715. A medicinal bottle made of lead contained the remedy "Theriacum" produced in the chemist's shop "Apotheke zur Goldenen Krone" (approximately 1628/1665) in Vienna. These two exceptional finds place the filling containing the skeleton to the late 17th century. Tulln was affected by floods of the Danube and plagues such as the Black Death, which drastically reduced the urban development and a reduction of the inhabited area occurred due to conflagration and demolition of houses in the early 17th century. Two building plots got new owners at the end of the century around the 1690, certainly the time when the cellar was backfilled, offering enough space to bury such a big cadaver in the center of the town. In summer 1683, Ottoman troops tried to reach Vienna and combed the region south of the Danube. The surrounding of Tulln was besieged by the army division, but the town itself never was conquered. On the contrary, written sources describe a peaceful surrender of two prisoners of war. The Ottoman commander released the imperial ambassador and his secretary in Tulln in August 1683 and obviously, as proven by written sources, the Ottoman troops were in contact with the inhabitants of Tulln. It is impossible to reconstruct how the camel did arrive within the town walls of Tulln. Its appearance might be linked to an exchange of local people with the troops or the Ottoman army simply left it behind. Apparently, the citizens took it inside the town, where they probably kept and displayed it as an "exotic animal". Further archeological research might answer this question. It seems quite conceivable that being not familiar with behavioral and feeding habits, the scarcity of food in wartimes, people did not keep it for long. Poor camel. First drafted in the army, then abandoned (or traded) to people who had never seen one before and didn't know how to care for it. At least it didn't end up food like its compatriots probably did.